Eyman has the expertise to service your steam or hot water boiler systems. The experience we have gained and the relationships we have established are a contributing factor in our success. Let Eyman help you get your boiler ready for winter. The best heating system a house can have is the one you don’t realize is there. No vents whooshing like a jet preparing for takeoff. No dust-spewing ductwork to run up your allergists’ bills. Just an even blanket of heat, right where you want it. That’s the appeal of radiant floor heating &emdash; It’s truly invisible. But a radiant floor system has more than just aesthetics going for it. 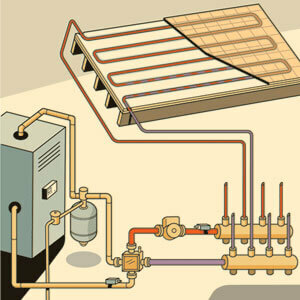 It’s also a highly efficient way to heat a house, increasing comfort as it reduces energy costs. For more information give EYMAN a call. What is the truth about Geo-Thermal and why does it make sense? Simply put, Comfort, Energy-Efficiency, Reliability and Return on Investment. In this day and age of the Geo-Friendly push for more sensible use of energy, the incentives are significantly in the homeowners favor. Get Your Geo-Thermal System Today! Closed-loop systems circulate a water-based solution through a “loop system” of small-diameter, high-density polyethylene underground pipes. Closed-loop systems can be installed horizontally, vertically or in a pond. Open-loop systems use an existing water well or surface water. Whether the system is open or closed, heat is transferred to or from the structure, regardless of outdoor temperature, to provide year-round comfort.